Not to be confused with Tsonga language. Dzongkha or Bhutanese (རྫོང་ཁ་ [dzoŋ'kʰa]), is a Sino-Tibetan language spoken by over half a million people in Bhutan, it is the sole official and national language of the Kingdom of Bhutan. The Tibetan alphabet is used to write Dzongkha. The word dzongkha means, "the language of the district", where kha is language and dzong is "district"—the district-like dzong architecture characterises monasteries established throughout Bhutan by its unifier, Ngawang Namgyal, 1st Zhabdrung Rinpoche, in the 17th century. As of 2013, Dzongkha had 171,080 native speakers and about 640,000 total speakers. Dzongkha and its dialects are the native tongue of eight western districts of Bhutan (viz. Wangdue Phodrang, Punakha, Thimphu, Gasa, Paro, Ha, Dagana and Chukha). There are also some speakers found near the Indian town of Kalimpong, once part of Bhutan but now in West Bengal. 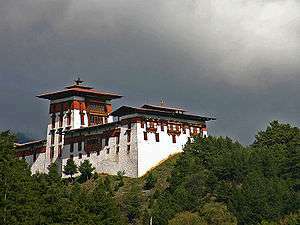 Dzongkha was declared as the national language of Bhutan in 1971. Dzongkha study is mandatory in all schools in Bhutan, and the language is the lingua franca in the districts to the south and east where it is not the mother tongue. The 2003 Bhutanese film Travellers and Magicians is entirely in Dzongkha. The Tibetan alphabet used to write Dzongkha has thirty basic letters, sometimes known as "radicals", for consonants. 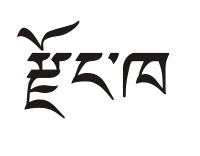 Dzongkha is usually written in Bhutanese forms of the Uchen script, forms of the Tibetan alphabet known as Jôyi "cursive longhand" and Jôtshum "formal longhand". The print form is known simply as Tshûm. There are various ways of Romanization and transliteration systems for Dzongkha, however all possible systems failed to represent the true phonetic sound. While the Dzongkha phonetic transliteration is widely used, others include the Library of Congress system, the Wylie transliteration system, the ALA-LC Romanization system and the IPA-based transliteration (Jacques 2012). The phonetic transliteration was developed by the linguist George van Driem. Dzongkha is usually described as having three tones: high, medium and low. However, in monosyllabic words, each tone can occur with two distinct contours. The high tone can be pronounced with either a flat or a falling contour, and the low tone can be pronounced with either a flat or rising-falling contour, the latter being a tone that rises to a medium level before falling again. The unaspirated stops /p/, /t/, /c/, and /k/ typically become voiced in the low tone and are pronounced [b], [d], [ɟ], and [a], respectively. The sounds are regarded as allophones. Similarly, the aspirated stops [pʰ], [tʰ], [cʰ], and [kʰ] are typically lightly aspirated in the low tone. The dialect of the upper social strata in Lhasa does not use voiced stops in the low tone. The alveolar trill ([r]) is in complementary distribution of the alveolar approximant [ɹ]; therefore, both are treated as one phoneme. The voiceless alveolar lateral approximant [l̥] resembles the voiceless alveolar lateral fricative [ɬ] found in languages such as Welsh and Zulu and is sometimes transcribed ⟨ɬ⟩. The consonants /m/, /ŋ/, /p/, /r/, /l/, and /k/ may appear in syllable-final positions. The Classical Tibetan final /n/ is still present, but its modern pronunciation is normally realized as a nasalisation of the preceding vowel, rather than as a discrete consonant (see above). However, /k/ is not pronounced in the final position of a word except in very formal speech. Also, syllable-final /r/ and /l/ are often not clearly pronounced but realized as a lengthening of the preceding vowel. The phonemic glottal stop /ʔ/ appears only at the end of words in the place of /s/, /t/, or /k/, which were pronounced in Classical Tibetan but have since been elided. Dzongkha is considered a South Tibetic language. It is closely related to and partially intelligible with Sikkimese, and to some other Bhutanese languages such as Chocangaca, Brokpa, Brokkat and Lakha. Dzongkha bears a close linguistic relationship to J'umowa, which is spoken in the Chumbi Valley of Southern Tibet. It has a much more distant relationship to Standard Tibetan. Although spoken Dzongkha and Tibetan are largely mutually unintelligible, the literary forms of both are both highly influenced by the liturgical (clerical) Classical Tibetan language, known in Bhutan as Chöke, which has been used for centuries by Buddhist monks. Chöke was used as the language of education in Bhutan until the early 1960s when it was replaced by Dzongkha in public schools. Although descended from Classical Tibetan, Dzongkha shows a great many irregularities in sound changes that make the official spelling and standard pronunciation more distant from each other than is the case with Standard Tibetan. "Traditional orthography and modern phonology are two distinct systems operating by a distinct set of rules." 1 2 How many people speak Dzongkha? ↑ Hammarström, Harald; Forkel, Robert; Haspelmath, Martin; Bank, Sebastian, eds. (2016). "Nuclear Dzongkhic". Glottolog 2.7. Jena: Max Planck Institute for the Science of Human History. 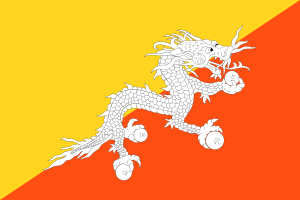 ↑ "Constitution of the Kingdom of Bhutan. Art. 1, § 8" (PDF). Government of Bhutan. 2008-07-18. Retrieved 2011-01-01. ↑ van Driem, George (2007). "Endangered Languages of Bhutan and Sikkim: South Bodish Languages". In Moseley, Christopher. Encyclopedia of the World's Endangered Languages. Routledge. p. 294. ISBN 0-7007-1197-X. van Driem, George (2007). "Endangered Languages of Bhutan and Sikkim: South Bodish Languages". In Moseley, Christopher. Encyclopedia of the World's Endangered Languages. Routledge. pp. 294–295. ISBN 0-7007-1197-X. van Driem, George L (1993). Language policy in Bhutan. SOAS, London. Wikimedia Commons has media related to Dzongkha.